A significant number of experiments, many conducted in Wisconsin, show the benefits of adding lime to fields where alfalfa is grown (Peters and Kelling, 1989, 1997). Similarly, a substantial amount of work has documented the benefits of adding potash to soils where alfalfa is raised (Kelling, 1995). Potassium functions in several physiological processes in forage legumes and is also linked to increased resistance to disease and lodging, increased carbohydrate production, and improved winter hardiness of alfalfa (Schulte and Walsh, 1993). Potassium also balances the negative charges of organic and inorganic anions within the plant and appears to be involved in starch formation, translocation of sugars, nitrogen assimilation and several other metabolic processes (Peters et al., 2000). It has only been in recent years that concerns have surfaced relative to the amount of K in forage tissue and the influence this has on ration balancing for dairy cows. An ionic 2.00 imbalance in the ration increases the potential for the cow to develop milk fever at freshening. One result of this concern has been the proliferation of promotions by various components of the farm service industry to apply small amounts of gypsum or other calcium sources to “rebalance” the harvested forages. For most Wisconsin forage producers the major source of Ca to their soils is aglime or the soil parent material, which contains limestone. Research has been conducted at three UW Agricultural Research Stations to examine the interactive effects of a wide range of soil pH levels (pH 4.5-7.3) along with various topdressed potassium rates on alfalfa forage mineral balance, yield and quality. In all cases, KCl was applied annually to provide 0, 100, 200, or 400 lbs/a of K2O. At all locations, soil pH and K rate had a significant effect on alfalfa yield and stand persistence. This study confirms the current UW recommendation of liming soils to pH 6.8 if alfalfa is to be grown in the rotation (Fig. 1). On the sandy loam soil at Spooner, an annual application of at least 100 lbs K2O/a was required to optimize yield. On the “heavier” textured silt loam soil at Marshfield and the very sandy (low CEC) soil at Hancock, the 200 lb/a annual rate was required to optimize yield (Fig. 2). The number of alfalfa crowns and percent alfalfa in the stand measured following third cutting was also significantly affected by pH and K rate in most cases. 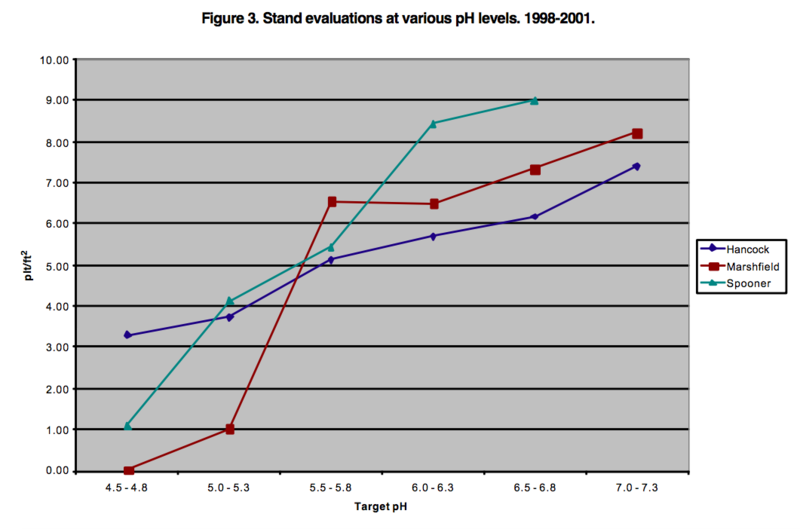 At the lowest pH levels, stands were the poorest and improved as soil pH approached 7.0 (Fig. 3). It appears that as the soil texture goes from the lightest (low CEC, sandy soil) to the heaviest (silt loam soil), the amount of topdressed K required to optimize stands increases (Fig. 4). The best stands were achieved with the 100 lb K2O/a annual rate at Hancock, 200 lb/a rate at Spooner and the 400 lb/a rate at the Marshfield location. 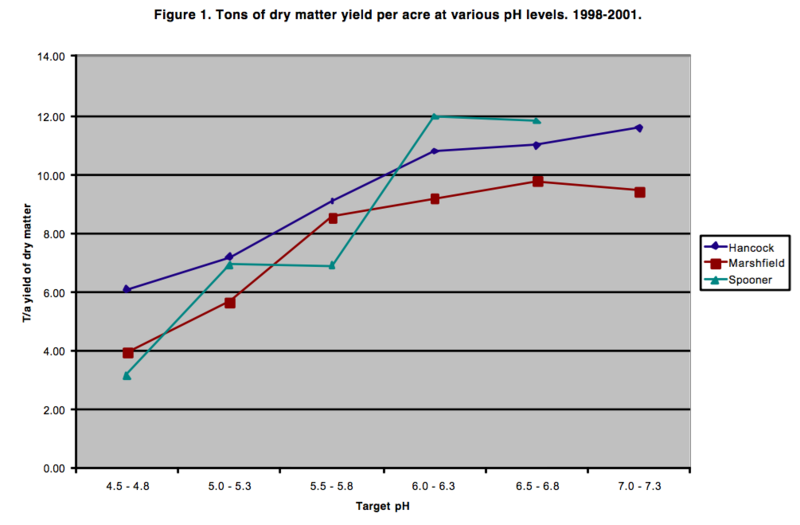 As soil pH increases, tissue K remains relatively unaffected, except at the highest pH levels where large applications of liming materials have been applied (Fig. 5). 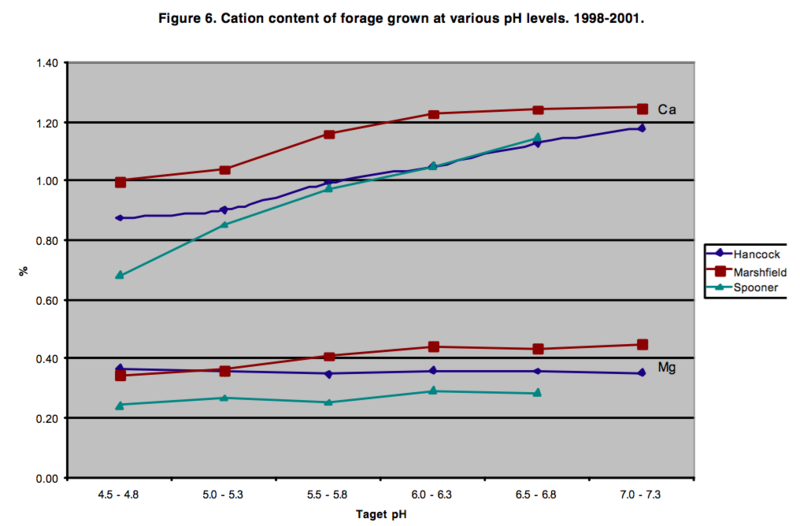 Tissue Ca increases as soil pH increases since the liming materials contribute significant amounts of Ca to the soil (Fig. 6). Tissue Mg tends to increase slightly with pH, particularly 1.20 where high rates of dolomitic lime have been applied, such as at the Marshfield location. Soil pH and the annual application of various rates of K were significantly correlated to virtually all tissue parameters measured at all locations. 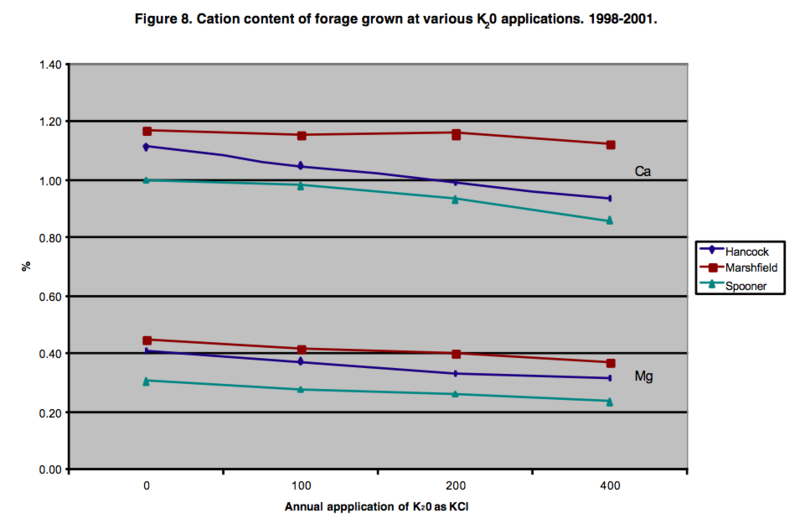 In general, as soil test K increased, tissue K increased (Fig. 7) and tissue Ca and Mg decreased (Fig. 8). This effect is likely the result of competition for the soil exchange sites at increasing annual application rates of K.
Caution must be used when balancing dairy rations using mineral levels based on NIR forage analysis. 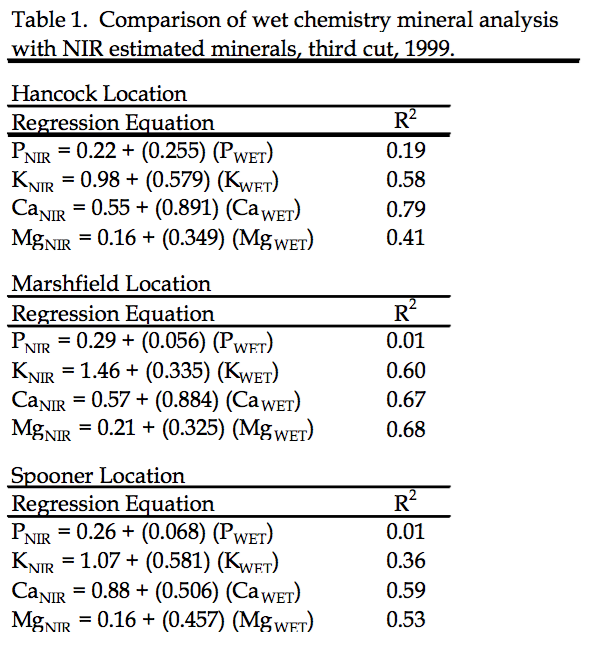 In this study, mineral estimates by NIR were not highly correlated to traditional wet chemistry mineral analyses (Table 1). In general, NIR tends to predict low testing samples higher than what they test by traditional wet chemistry methods and predict lower values for high testing samples when compared to wet chemistry methods. This is particularly important for K as it has a significant impact on the susceptibility of dairy cows to metabolic disorders such as milk fever. At all locations, as soil K increased, tissue K increased and tissue Ca and Mg tended to decrease. Also, the annual application of K resulted in a buildup of soil K and a decrease in soil test Ca and Mg. Increasing soil test Ca did not appear to consistently result in reduced tissue K levels. However, liming these acid soils was essential to optimize yields of alfalfa. Keeping soil test K levels in the optimum range appears to be the best strategy for keeping forage tissue K levels in acceptable ranges for use as dairy feed. Kelling, K. A. 1995. High potassium in alfalfa: fertilizer effect. In Proc. 19th Wis. Forage Production and Use Symposium. Eau Claire, 25-26 Jan. Wisconsin Forage Council, Madison, WI. Peters, J. B., K. A. Kelling and P. E. Speth. 2000. Alfalfa response to K at various soil pH levels. Proc. Wis. Fert., Aglime and Pest Mgmt. Conf. 39:397-404. Peters, J. B., and K. A. Kelling. 1989. Interaction of pH and N on alfalfa establishment, yield and stand persistence. Proc. Wis. Forage Council Symp. 13:114-122. Peters, J. B., and K. A. Kelling. 1997. Alfalfa varietal response to soil pH. Proc. Wis. Fert., Aglime and Pest Mgmt. Conf. 36:163-171. Schulte, E.E. and L.M. Walsh. 1993. Management of Wisconsin Soils. University of Wisconsin – Extension Publication A3588.